There is something distinct in Montréal, something alive that is unique to our city. Walk through your favourite neighbourhood and you’ll feel a creative energy that brightens its public spaces and building façades. Montréal serves as an ample canvas for street artists. Everywhere we stroll, we are surrounded by urban art creations, murals and graffiti, many of which would make art galleries rightly jealous. A profession that is gaining in popularity, more and more urban artists are making a living in the city via their art. Hundreds of people consider themselves street artists, graffiti artists, muralists or all the above. The distinction between art hanging in galleries and street art (and what makes it beautiful) is its public nature, no one owns it; therefore it is eternally in the collective realm, forever evolving. If you are a Montréal urban art admirer, there are gatherings to help you uncover all types. Two amazing ways to make the most of urban art, besides catching sight of them in the streets. Beaux Dégâts evenings are held every two or three months at the famed Foufounes électriques, close to the Saint-Laurent Métro. These art competitions, open to the public, aim to confront the street artists’ reality to the world of fine art. Their mission: to reunite art with the importance of community and sharing within an accessible, yet unusual setting. The concept is simple: artists create murals according to a theme that is revealed that night, and the public then votes for its favourite. The grand prize? The privilege of adorning your competitors’ murals with your own individualized touch. The result? An enjoyable evening with interesting discussions in the company of true works of art. Visit the Beaux Dégâts Facebook page to learn about upcoming events! Still in the Saint-Laurent Boulevard area, a few steps from the project GLO 2, each year, the MURAL Festival attracts more than a million art-goers and curious bystanders. For eleven days in June, the Boulevard takes on the looks of an art fair, hosting artists from here and away, proudly displaying their works. With an ambition of broadening access to urban art, the fair holds a variety of events such as concerts, conferences, outdoor expositions and culinary sampling. Visitors can even witness the creation of a mural in real time. 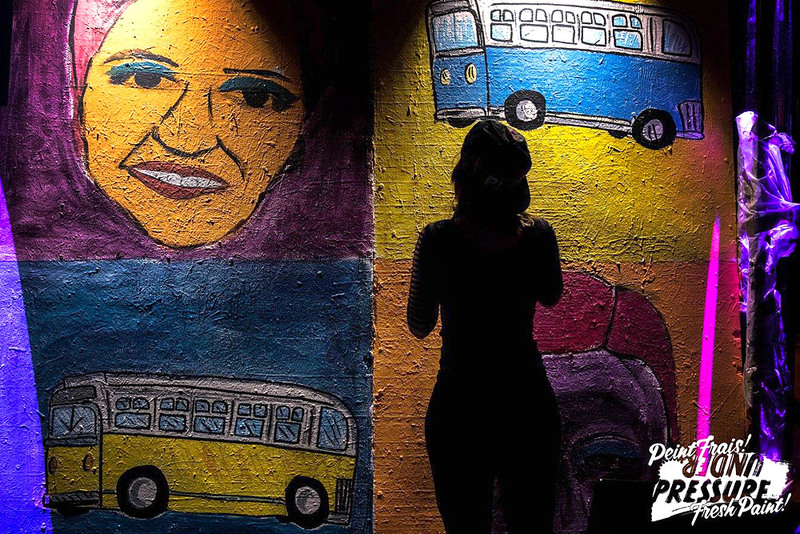 MURAL is the perfect opportunity to learn more about urban art and to rub shoulders with people who are passionate about it, all while enjoying beautiful summer days. The festival is produced by Lndmrk, a creative marketing agency that uses art, in all its forms, to create associations between businesses and the public.